The thruster exercise combines a front squat with an overhead press and is a popular and effective exercise with fitness enthusiasts and elite athletes. Performed with heavy weights, thrusters will develop whole body strength and power. Performed with light weights for high repetitions, thrusters will improve your muscular endurance and cardiovascular conditioning. 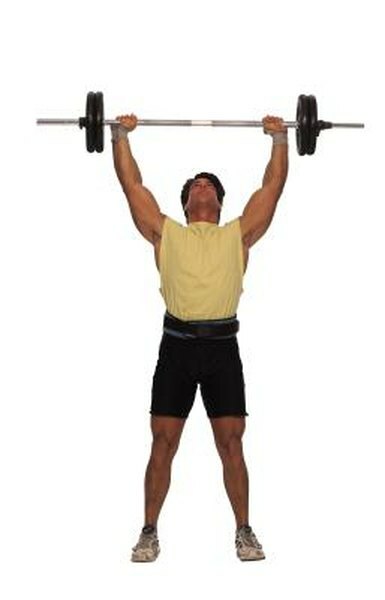 To perform a thruster, stand with your feet shoulder-width apart and turn your feet slightly out. Hold a weight at shoulder height. Ensure that, regardless of the type of weight you are using, your forearms are perpendicular to the floor so your hands are below your elbows. Lift your chest, push your hips back and squat down until your thighs are parallel to the floor. Drive up and out of the squat position and simultaneously push the weight overhead. Lower the weight to your shoulders and then descend into another rep. Do not allow your lower back to round during the performance of this exercise as this may lead to injury. Thrusters use a large proportion of your muscles. Knee and hip extension targets your quadriceps, hamstrings and glutes while your erector spinae or lower back muscles must work with your abdominals to keep your spine upright. Driving the weight overhead targets your deltoids or shoulder muscles and extending your elbows as you complete each repetition is the job of your triceps. Unlike many machine-based exercises, thrusters uses all of these muscles in synergy, which means they work together. This is how your body functions in nature. Because thrusters use so many muscles in synergy, they are very beneficial to athletes. Thrusters can be performed in a variety of ways depending on your level of fitness and the equipment you have available. In order of technical difficulty, thrusters can be performed with a medicine ball, barbell, dumbbells or kettlebells. You can also perform this exercise holding a weight on one hand only. This adds an element of balance that makes the exercise even more challenging. While thrusters are a safe if demanding exercise, they are not without risks. Pressing a weight overhead exposes you to injury if you lose control of the weight. As you fatigue, you can descend into the deep squat position too quickly, which will place an inordinate amount of stress on your knees. Weak or fatigued lower back muscles can result in a rounding of your lower back which may also lead to injury. If you are unsure about how to correctly perform this exercise, get advice from a qualified personal trainer or strength coach.